It seems that each time DC makes a animated movie, I immidately track it down and watch it as soon as possible. There is a reason for that. The DC animation studio has really discovered the secret to bringing the DC stable characters to life, and its too bad that their efforts are limited to direct-to-video. If I were Zack Snyder, I would be collecting all of these movies and watching them over and over again to prepare for "Batman vs. Superman: Dawn of Justice" and any other movie he maybe attached to making. The animated DC films are the template I want for these characters, right here. Finally, a group of filmmakers understand these characters, knows what makes them unique and take their cheesiest traits and somehow make them cool. 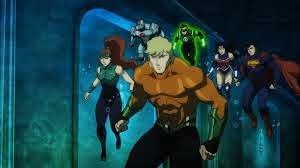 As you could probably tell by the title, "Justice League: Throne of Atlantis" takes us to Atlantis, which means Aquaman becomes the main linchpin for this movie. When we meet Arthur Curry, the alter ego of Aquaman (voiced by Matt Lanter) he is an aimless drifter, talking to sea life animals, not really much going on. We learn he suffered a tragedy which has kind of taken him out of life. But he is being stalked by two unknown forces, seeing what he doing. "Throne of Atlantis" is very much about one discovering their own potential, and while that is common in several superhero movies, I was at a loss to see just how updated the idea can be. While Curry is off discovering himself, the Justice League is investigating the mysterious sinking of a United States submarine, and it becomes clear that Atlantis is somehow linked to the sinking of the submarine. This sets the path for Curry to meet the Justice League and to find out what really is going on. Jerry O'Connell, Jason O'Mara, Rosario Dawson, Christopher Gorham, Nathan Fillion, Shemar Moore, and Sean Astin provide the voices for Superman, Batman, Wonder Woman, The Flash, Green Lantern, Cyborg and Shazam respectively. Each actor does very good voice work and I especially love the work done by Astin, as he really embraces the childlike sensibilities of his character. I also really like the work done by Sam Witwer as Ocean Master, who is the one manipulating the events of the film. Ocean Master is a great villain because you can kind of understand his need to destroy humanity, even if his methods are way too extreme. Overall, I really like how each character is handled and it seems the team behind this movie fully embraced the DC characters. I love how, in the end, it is Batman who out-strategizes the villains in order to win the day. As I also said, the more cheesy traits of the characters seem cool in this movie. Never would I ever buy into Aquaman's ability to communicate with sea animals, but there is scene that will make you smile, for sure. I liked that the action was a little rough around the edges, without completely leaving family-friendly territory. I like that there are several ways to introduce these characters to fans without completely stepping into darkness. I like that some people still know how to have fun with superheroes without making them completely adult. It just goes to show that not every superhero movie, animated or not, needs to be gritty or grounded in reality. Everything seems believable here and everything seems fun. There is a good reason why you should all start jumping into the DC animated films. Here's to hoping the live-action universe can live up to this.